Has this ever happened to you? You are standing there, minding your own business, when someone comes up and asks you to share your list of the people, both living and dead, that you would most like to invite to a dinner party. Are you prepared for this? No? Me neither. I don’t have my list finalized, but I can tell you that one person I know would be there is my all time favorite actor, Alan Rickman. And sadly, this week we say goodbye to this great man, after his death from cancer. A light has gone out in the world. I discovered Alan Rickman decades ago, when he starred in one of my all time favorite movies, Truly Madly Deeply. If you haven’t seen this film, you need to run out right away and do so. It’s quirky and sublimely beautiful, always a potent combination. Watch this short video clip from the movie, and prepare to be uplifted. But first, let me set the stage a bit. Alan Rickman plays Jamie, a musician who has recently died, to his chagrin, of a sore throat. His partner Nina is devastated. Until Jamie comes back as a ghost. This clip is from the reunion scene. 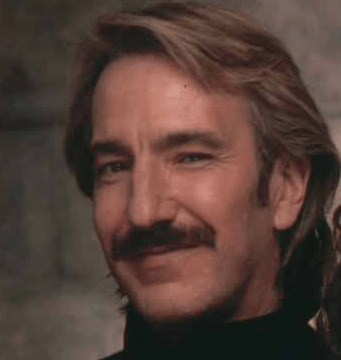 From this movie, Alan Rickman went on to another fantastic role as the outrageously funny Sheriff of Nottingham in Robin Hood, Prince of Thieves, and then on to international stardom in such films as Die Hard, and the Harry Potter series. He usually plays the bad guy, and in fact I’ve been waiting for years and years to see him cast as the villain in a James Bond movie. Because frankly, those guys are so over the top as to be uninteresting. While Alan Rickman’s characters are nuanced, with hidden, seething depths suggesting layers and layers of unexplored qualities – old agonies, pains and passions, a whole muddle of psychology, with a touch of irreverence thrown in to round things off nicely. His acting was truly, madly deeply. Can’t you just imagine him as a Bond bad guy? Wouldn’t you love to really understand what makes a man like that? Sadly, we will never know. RIP Alan Rickman. Thank you for the inspiration of your acting. You have made the world a much better place. I hope you can still come to my dinner party. This entry was posted in Loves and Losses and tagged Alan Rickman, Truly Madly Deeply, Ultimate Dinner Party. Bookmark the permalink. Did you ever see Galaxy Quest? or Bottle shock? Those are two of Alan Rickman’s funniest movies. I have a wine maker acquaintance, Giuseppe Sesti (makes incredible Brunello), in Tuscany who was one of Alan Rickman’s best friends. They ran an outdoor opera company there every summer for years together. Giuseppe loved Alan with all his heart. I’m sure he’ll be heartbroken to lose his friend. And Truly, Madly, Deeply is a quiet giant in storytelling. I adore it. Actors die but their work never will. Wow, you are close to touching greatness Karen. What a beautiful story. I loved Bottle Shock but must now see Galaxy Quest. It’s a bit like discovering a photo is someone you loved who has died. Rather a nice surprise. I also loved his role in “Sense and Sensibility. I love “Truly Madly Deeply” too. The scene early in the film where Juliet Stevenson/Nina is talking to her therapist about how much she misses Jamie and breaks down into tears is the most realistic scene of someone grieving I think I’d ever seen when that movie came out, it’s quite heart-breaking. In a very British way, though, the film veers between being light-hearted and being very tender and poignant. Also: in amongst all the news after Alan Rickman’s death I read that he was actually offered a part as a villain in a James Bond film but turned it down to do some other project – directing a theatrical production, I think. Perhaps he didn’t want “Bond villain” to be the highlight of his acting career in popular memory. Oh! I hadn’t heard that. I can see him doing that – he didn’t want to do Die Hard either. Didn’t see himself as an action movie guy. The grieving scene is hard to watch. But overall I thought the movie a great part of the conversation on grieving. Happy new year to you down under! One of my favourite movies. He will be missed. And what a lovely tribute.